According to the Cornish lists, Morwenna was one of the many holy daughters of King Brychan Brycheiniog. 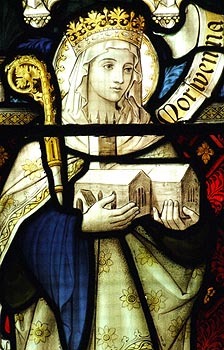 She was trained in Ireland before becoming one of the Welsh saints who crossed over to Cornwall. Morwenna made her home in a little hermitage at Hennacliff (the Raven's Crag), afterwards called Morwenstow. It stands near the top of a high cliff looking over the Atlantic, where the sea is almost constantly stormy, and from where, in certain atmospheric conditions, the coast of Wales can be seen. She built a church there, for the local people, with her own hands. She carried the stone, on her head, from beneath the cliff and where she once stopped for a rest, a spring gushed forth. It can still be seen to the west of the church. When she was dying, her brother, St. Nectan, came to see her from Hartland and she bade him raise her up that she might look once more on her native shore. This occurred some time in the early 6th century, possibly on 24th July. An interesting, but much defaced, polychrome wall-painting was found on the north wall of the chancel of Morwenstow church, thought to represent this lady. It shows a gaunt female clasping to her breast, with her left hand, a scroll or volume; the right arm is raised in blessing over a kneeling monk. She is sometimes identified with St. Merryn, whose feast day is 7th July, but Doble believes that this was originally a male saint. She should also not be confused with her sister, St. Marwenna.